The girls absolutely love Pocky Sticks. If you’re not familiar with them, they're a popular Asian snack consisting of long, thin crackers dipped in icing. I received several packs of strawberry-flavored Pocky Sticks from Asian Food Grocer, and instead of just letting the girls devour them, I thought it would be fun to use them in a dish. I adapted one of Ina Garten's brownie pudding recipes and made it look pink to match the Pocky Sticks. I used mini marshmallows to create teeth and Godiva chocolate pearls for the eyes. The Pocky Sticks serve as the hair. 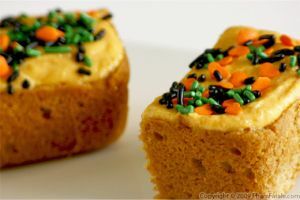 I’m thinking of serving these happy-looking treats to the kids for Halloween in a couple of weeks. 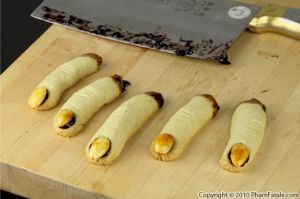 Last year, I made witch-looking finger cookies that looked so realistic, children in my little munchkin’s class refused to eat them! There are only a few days left for the chance to win a $50 gift certificate. Don't forget to enter the giveaway; it takes only a few seconds to participate! Using an electric hand-held mixer, whisk the eggs with the sugar until you get a pale yellow foam. It will take about 5-6 minutes. The consistency should be very airy. 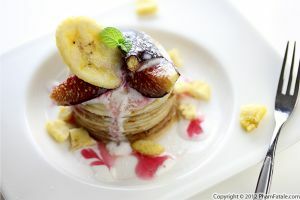 Add the vanilla and strawberry extracts. Set aside. In another bowl, combine the flour, salt and strawberry powder. Sift all the dry ingredients. Add the dry ingredients to the egg mixture. Stir until combined, then slowly add the cooled melted butter and beet juice (for color). Divide the batter into 8 (7-ounce) ramekins that were previously greased with butter. Bake the muffins for 1 hour. 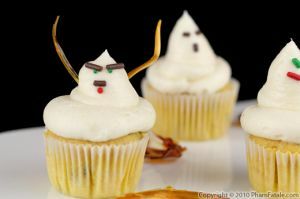 Decorate with 5 marshmallows for the mouth, 2 chocolate pearls for the eyes and a package of pocky sticks for the hair. Serve with a spoon. Dig in to the bottom for the gooey, sweet pudding part! Accompany with a nice, unsweetened hot tea for adults. Trick or treat? Kids will love it! Sifting dry ingredients helps get rid of lumps of flour and strawberry pwder and aerates the mixture when the eggs are added. FYI: ½ pound of butter = 1 cup = 16 tablespoons = 2 sticks of butter. I added a few teaspoons of strawberry extract to reinforce the flavor.I buy it from a local store called called the Milk Pail Market. The address is 2585 California Street, Mountain View, CA 94040. I used Godiva dark chocolate pearls for the eyes. 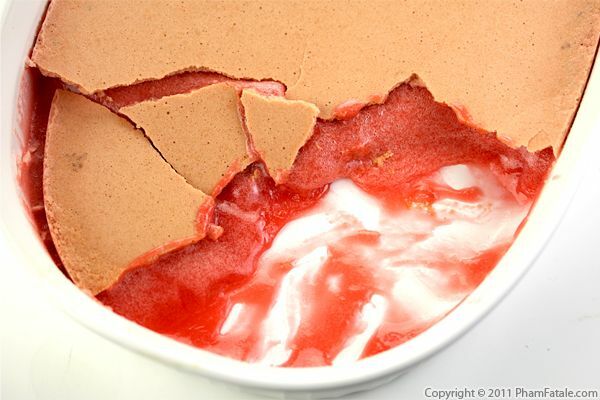 I used Nesquik brand strawberry powder drink mix. 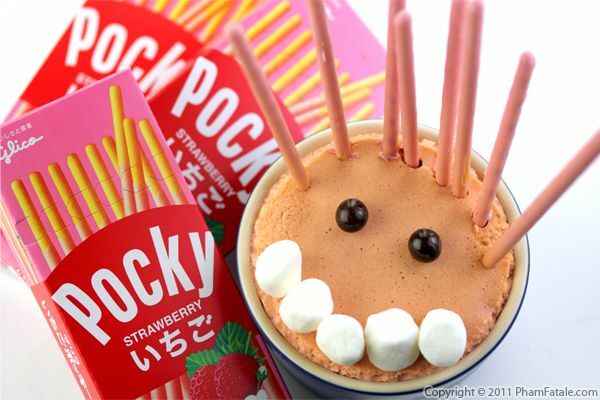 You can find strawberry pocky sticks through AsianFoodGrocer.com. During checkout, enter coupon code PHAMFATALE (exclusively for Pham Fatale readers) and get 10% off your entire order (coupon expires on October 22nd, 2011). 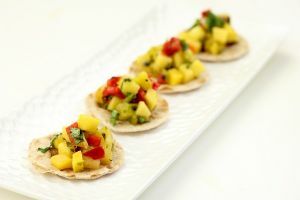 I used individual ramekins for a faster baking time. If you decide to bake the brownie pudding in a (9 x 12") dish, extend the cooking time by at least 10 more minutes. 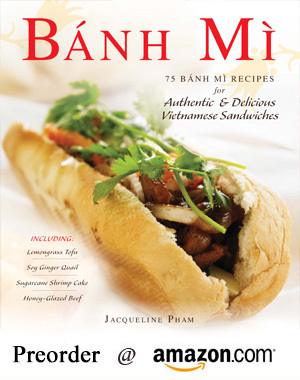 Published By: Jacqueline Pham on October 14, 2011.